Walmart U.S. Chief Merchandising Officer Steve Bratspies. This post is part of the Ten Items or Less blog. In a presentation designed to pump up 4,000 visiting employees of Wal-Mart Stores for the summer selling season, U.S. Chief Merchandising Officer Steve Bratspies, standing on a stage at Bud Walton Arena, highlighted his predictions for hot products this summer including sneakers with flashing lights in their soles, Caramel M&Ms, pool floats in shapes like bacon and cupcakes and a pop-up “instant cabin tent” with stitched-in LED lighting that he said could assemble in less than 60 seconds. Bratspies pulled out a stopwatch while some assistants put that last claim to test on stage during Walmart’s U.S. Associates meeting last week in Fayetteville, Ark., only to see a tent pole fail after a minute had passed and the half-assembled unit dragged off the stage like a Gong-Show reject, practically begging the few dozen of us journalists bused in to witness the event to dream up ways to work a folded-tent metaphor for Walmart’s annual Shareholders Week events. Only, that didn’t really happen. Walmart, more so than in any of the past years I’ve attended their annual event, came off with a palpable sense of confidence and competence, as the momentum of its remarkable reinvention has continued to gain steam, the tent collapse notwithstanding. 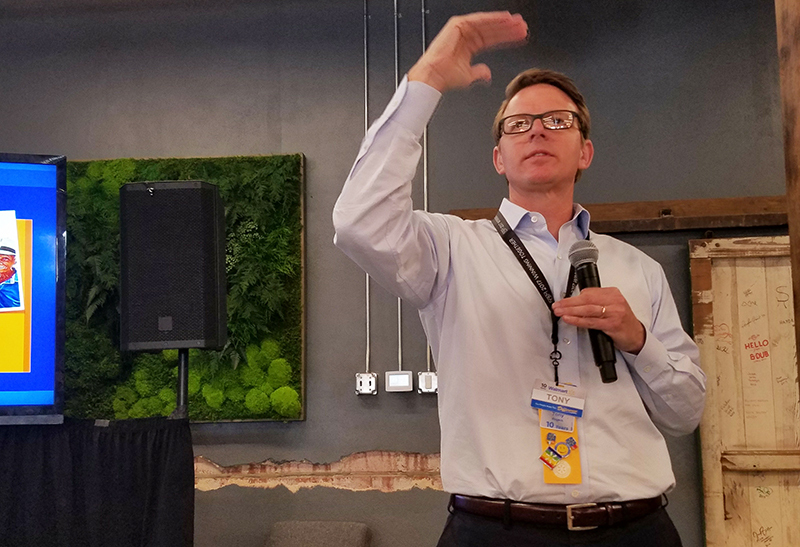 As I wrote about from Arkansas last week, the company highlighted benefits of a new and much-needed training initiative, shared details of a growing grocery delivery business at Jet.com, highlighted creative new ways it was exploring to attack online order fulfillment costs, and showed off a number of new food offerings it was sourcing, tracking and preparing in efficient new ways. Stitching together all of those things was a thread of physical and digital integration that officials have talked about achieving for years at this meeting but had never before appeared as real. The training and in-store execution demonstrated this year, for example, was supported by virtual reality units in the classroom and a new suite of apps accessible on employee handhelds in stores. Jet’s acquisition last year, and its delivery of a “gamified” pricing initiative, is seeping into Walmart.com and helped to fuel eye-popping 63% quarterly e-commerce sales gains after so many quarters of Walmart having of lagged the online sales growth of peers. Even the test of store employee home delivery was a efficiency-enriched technology play, and delivered at startup speed: The sign-up and delivery (and I’d assume, the pay) process is all encased in GPS-enabled app geared only to assign employees who live south of town to a make a delivery in that direction. Still, we can’t overlook this is all happening as U.S. food retailers adjust to a newly aggressive pricing posture from Walmart, and the industry, Walmart included, prepares to do battle in a grocery landscape that looks to be increasingly influenced in the years ahead by hard-discounters. I asked McMillon about how prepared he felt Walmart was for this — and how having experienced a similar market shift in Europe would play to its strategy. It is hard to imagine Walmart’s preparation, momentum and new swagger won’t help to sustain it. So could a Lidl-Aldi influenced world actually be good thing for Walmart? Put it this way: They're not exactly folding their tents.